Welcome to the homepage of the Gentlegift Cattery. The owner/operators of this cattery are Dennis and Judy Ganoe. We raise Korats or Si-Sawat cats. They are the "Good Luck" cats from Thailand. To find answers to the most often asked questions about the Korat, visit the Korat FAQ. We have also written articles about our breed and you may want to read them as well. This first is an article that was published in Cat Fancy magazine. 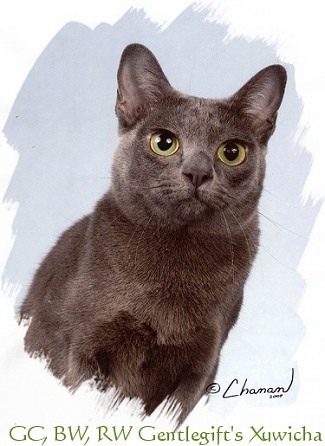 The other is a story about Minde, Judy's first Korat. We hope you enjoy your visit to our cattery website and if you have any questions, do not hesitate to ask. We love talking about our Korats. All contents are copyrighted by Judy and Dennis Ganoe and may be used only with permission of the author. Pictures are the property of the photographer and may only be used with permission of the photographer and the authors.